A shared reading/song, this one to the tune of "Sur le pont". I prefer the version of this printable that lets students add the illustrations. 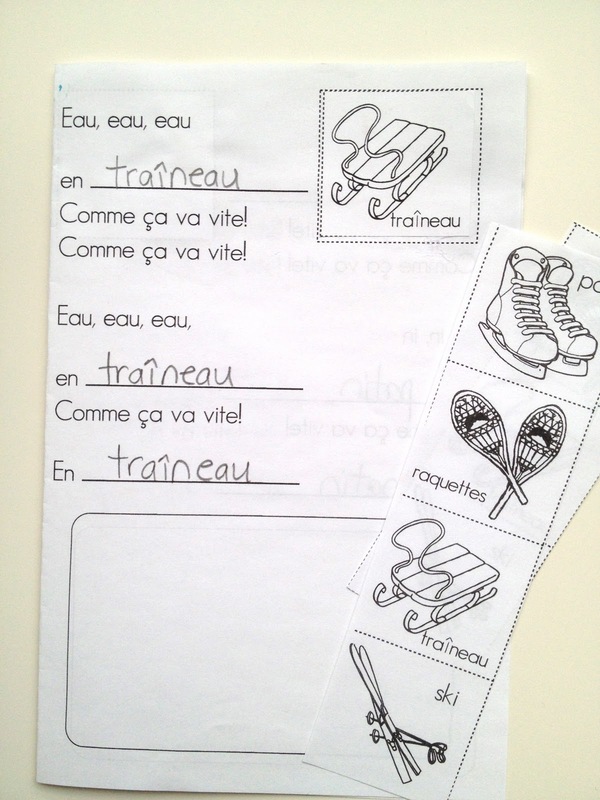 Students find/circle/identify the "ette", "in", "eau"and "i". Joli Phonique (Jolly Phonics) hand signals and cue cards are the tools we have found to be most effective in teaching and reviewing letter sounds and sound blends. The website offers the same English resources in French as well. Could students make up their own verses to the song? Hé Madame, je connais beaucoup de "eau". Eau eau eau, en bateau, eau eau, eau, en vaisseau, oe oe oe en canoe! Could each group find several verses for a certain sound blend (ou, eu, au, on, oi and so on)? What about those pesky ones like an, am, en and em? I can think of someone that would be just the right challenge for. Could you imagine a grade 5-7 FSL class using this kind of resource?